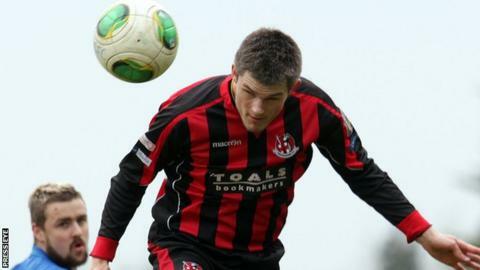 Crusaders welcome back Craig McClean as the Premiership leaders prepare for a top-two showdown with Portadown at Seaview on Friday night. The defender returns from suspension with the Crues going into the game four points clear of the Ports and Linfield. "Portadown were my tip for the title as I thought they had the best-equipped team," said Crues boss Stephen Baxter. "They have beaten us twice this season, and quite comfortably, so we need to get a lot closer to them on Friday night." Baxter's side opened up a healthy gap at the top thanks to a 2-1 win over Glentoran last weekend while the Ports slipped up by drawing 5-5 against Ballymena United at Shamrock Park. Join presenter Michael McNamee for Irish Premiership action on a Sportsound Special on Friday from 19:30 GMT on BBC Radio Ulster M/W. Joel Taggart and former Linfield boss David Jeffrey will take you through the action from Crusaders v Portadown at Seaview. There are regular reports from Friday's other three matches. "It's going very well for us at the minute but there is such a long way to go and we will not get carried away," added Baxter. "Our expectations are always high and remain the same as from the start of the season - our players are used to." "So the preparation for each game is the same and we're really looking forward to what should be a great game." Ports defender Chris Casement has signed a new contract which will keep him at the Club until at least 2018. Four games have been switch to Friday night because of Saturday's League Cup final between Cliftonville and Ballymena United. Glenavon take on basement boys Institute at Mourneview Park while fellow strugglers Dungannon Swifts are away to Coleraine. Warrenpoint Town moved above Institute on goal difference thanks to a 2-2 draw with champions Cliftonville last Saturday and they meet Ballinamallard United at Milltown. "It's a massive game although every match we play now is massive for us," said Town manager Barry Gray. "It is a must-win match and if you look at our home fixtures until the league split, the target is maximum points from them all. "From our perspective, albeit I am biased, we go in as favourites for every game and if you are going on current form we will edge it."